The leading factor augmenting the growth rate of the global anhydrous aluminum chloride market currently, is the steady and sure growth in the demand and production of dyestuff and pigments. This demand is apparently much higher in Asia Pacific than other regions. The demand for anhydrous aluminum chloride across the world is also being driven by its increasing scope of use in the industries of consumer goods, pharmaceuticals, and especially cosmetics. However, the global anhydrous aluminum chloride market is being restricted in its growth by factors such as the growing concern regarding manufacturing emissions and their consequences on the environmental health. Steps are being taken to avoid breaching regulatory constraints for the same, but at the cost of increased maintenance efforts and prices. The global anhydrous aluminum chloride market was valued at US$683.9 mn in 2015. It is projected to expand at a CAGR of 3.3% within a forecast period from 2016 to 2024. By the end of 2024, this market’s revenue is estimated to reach US$912.3 mn. The global anhydrous aluminum chloride market has been segmented on the basis of form, into powder and granules. Anhydrous aluminum chloride granules are widely used in various key applications of the market and are therefore showing a far greater rate of increase in production over powders. Thus, granules are expected to keep leading the global anhydrous aluminum chloride market on the basis of form. Based on applications, the market has been segmented into dyestuff & pigments, hydrocarbon resins, pharmaceuticals, fumed alumina, and flavors & fragrances. The segment of dyestuff and pigments is the leading application of anhydrous aluminum chloride due to their broad spectrum of use in the production of ethyl benzene and common dyes. Anhydrous aluminum chloride is heavily used in the dyestuff industry as a catalyst for the production of pigments and derivatives of anthraquinone. By volume, the dyestuff and pigments segment held over 24% of the global anhydrous aluminum chloride market in 2015. Asia Pacific held the leading share in the global anhydrous aluminum chloride market for 2015 in terms of both growth rate and volume consumed. The Asia Pacific rise in demand is primarily attributed to the increasing demand for pharmaceuticals and consumer goods in China and India, the two highly promising countries of the world in terms of industrial evolution rate and increase in consumption and product demand. By volume, Asia Pacific held more than 44% of the global anhydrous aluminum chloride market in 2015. It is also expected to lead the global scenario for anhydrous aluminum chloride in terms of growth rate expansion over the coming years. Europe constituted a significant share in this market’s revenue in 2015. However, Europe is expected to show a marginal decrease in consumption levels over the coming years given the current recovery phase of this region’s economy. The Middle East & Africa region is an attractive market as well, driven by the increasing developments in the pharmaceutical and petrochemical industries. The global anhydrous aluminum chloride market is highly fragmented in nature and the leaders of the market do not hold significantly high shares outside of their core regions of operations. As of 2015 the leading players in the global anhydrous aluminum chloride market included BASF SE, Gulbrandsen, Aditya Birla Chemicals, Gujarat Alkalies & Chemicals Ltd., Nippon Light Metal Company Ltd., and Base Metal Group. This report analyzes and forecasts the market for anhydrous aluminum chloride at the global and regional level. The market has been forecast based on volume (tons) and revenue (US$ Mn) from 2016 to 2024. The study includes drivers and restraints of the global anhydrous aluminum chloride market. It also covers the impact of these drivers and restraints on demand for anhydrous aluminum chloride during the forecast period. The report also highlights opportunities in the anhydrous aluminum chloride market at the global and regional level. The report comprises a detailed value chain analysis, which provides a comprehensive view of the global anhydrous aluminum chloride market. Porter’s Five Forces model for the anhydrous aluminum chloride market has also been included to help understand the competitive landscape in the market. The study encompasses market attractiveness analysis, wherein end-users are benchmarked based on their market size, growth rate, and general attractiveness. The study provides a decisive view of the global anhydrous aluminum chloride market by segmenting it in terms of form and application. These segments have been analyzed based on present and future trends. Regional segmentation includes the current and forecast demand for anhydrous aluminum chloride in North America, Europe, Asia Pacific, Latin America, and Middle East & Africa. The report also covers demand for individual end-user segments in all the regions. The report provides the estimated market size of anhydrous aluminum chloride for 2015 and forecast for the next nine years. The global market size of anhydrous aluminum chloride has been provided in terms of volume and revenue. Market numbers have been estimated based on key form, and application segments of anhydrous aluminum chloride market. Market size and forecast for each major form and application have been provided in terms of global and regional markets. Secondary research sources that are typically referred to include, but are not limited to company websites, annual reports, financial reports, broker reports, investor presentations, and SEC filings, internal and external proprietary databases, and relevant patent and regulatory databases, national government documents, statistical databases, and market reports, news articles, press releases, and webcasts specific to companies operating in the market, ICIS, National government documents, statistical databases, and market reports, World Health Organization (WHO), International Hyperhidrosis Society, Journal of the Dermatology Nurses’ Association (JDNA), The Aluminum Association, and UNCOMTRADE. Primary research involves e-mail interactions, telephonic interviews, and face-to-face interviews for each market, category, segment, and sub-segment across geographies. We conduct primary interviews on an ongoing basis with industry participants and commentators in order to validate the data and analysis. Primary interviews provide firsthand information on market size, market trends, growth trends, competitive landscape, and outlook, etc. These help validate and strengthen secondary research findings. These also help develop the analysis team’s expertise and market understanding. 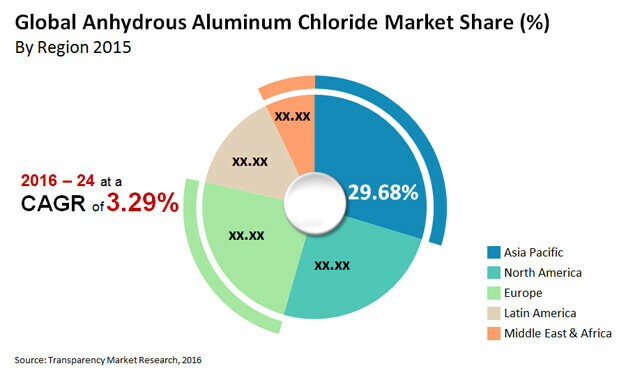 The study includes profiles of major companies operating in the global anhydrous aluminum chloride market. Key players operating in the anhydrous aluminum chloride market include BASF SE, Aditya Birla Chemicals, Gulbrandsen, Nippon Light Metal Company Ltd., Gujarat Alkalies & Chemicals Ltd., Base Metal Group, and others. Market players have been profiled in terms of attributes such as company overview, financial overview, business strategies, recent developments, and SWOT analysis.